Foolproof integration due to the refshots® WordPress plugin. WordPress Web Gallery - Function "Filter"
The refshots® web gallery "Filter" can be placed on one page of your WordPress website via [short code]. The integrated filter function allows your visitors to show images from a certain category withing the gallery view, e.g. "Bath" or "Kitchen", without having to reload the page. Application example: The craftsman Max has an own website. He wants to show images of his previous work on the subpage "References" to present his visitors a better overview over his services. Max has different areas of work: flooring and coating, painting of interior walls, and facade construction. He chooses the web gallery "Filter" for a clear display of his references and integrates it into his website with the help of an agency. Then Max sets up three categories within the refshots® app: "Floors", "Interior Walls", and "Facades". He uploads fitting reference images using the app and displays them directly on his website. Max' new visitor and potential customer Tim would like to browse the services that Max provides so he clicks on the subpage "References". He immediately sees the published reference images and can filter them using the menu above the gallery. Tim looks for the right partner to install his floorings so he clicks on the menu item "Floors". Now he can see all the pictures that Max has assigned to the categorie "Floors" without having to reload the website. 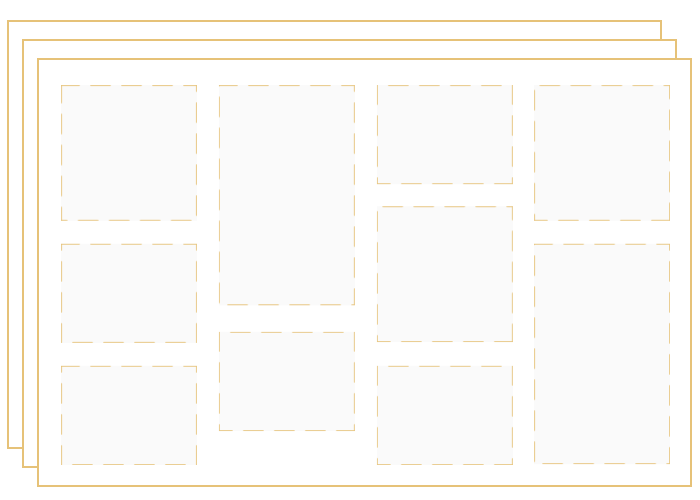 The images in the categories "Interior Walls" and "Facades" are automatically hidden. WordPress Web Gallery - Function "Multi"
The refshots® web gallery "Multi" can create a separate gallery out of every category that you set up in the refshots® app. Like this, you are able to display different galleries on any number of pages on your website and manage them conveniently via the refshots® app. Application example: Fitness centre manager Uwe has an own website for his company with the menu items "Training", "Courses", "Sauna", and "Squash". On the different pages, he wants to give the visitors an overview over the various areas of his gym, so he creates four categories in the refshots® app: "Training", "Courses", "Sauna", and "Squash". Then he uploads fitting images. 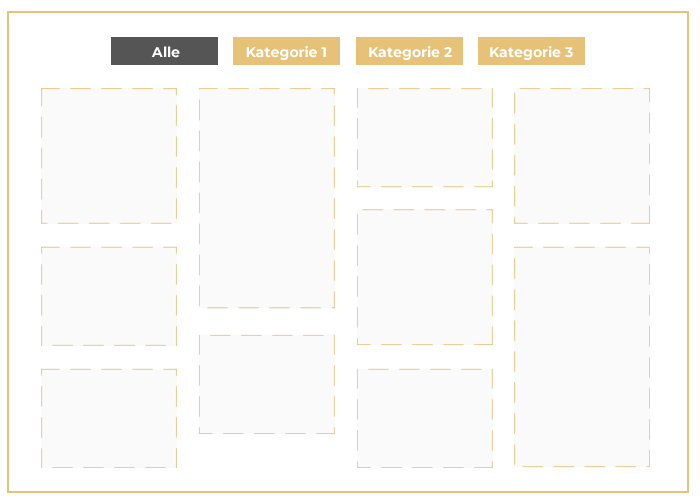 Since Uwe needs different galleries on several web pages, he chooses the web gallery "Multi" to create a separate gallery for every category that he then can integrate himself or with the help of his agency. Klaus, a website visitor, is interested in "Courses" and "Sauna". On the subpage "Courses", he finds not only information covering the offers but also a gallery with photos of the rooms and past courses. Seeing these, he feels motivated to participate himself. On the subpage "Sauna", he can view the sauna facilities and the relaxation area. WordPress Web Gallery - Function "Mix"
Use the features of both functions ("Filter" and "Multi") and become even more flexible with the "Mix" function. The gallery feature "Mix" allows you to display defined categories within a gallery. As a result, you can now view categories defined by you on different pages of your website with or without filter function. Example of use: Restaurant owner Figo has its own website. Figo is open all day and offers its guests breakfast, lunch and dinner. Of course, he also has a variety of drinks on offer. On his website he has created pages for breakfast, lunch and dinner to give a better insight. At the beginning Figo creates four categories with the help of his refshots ® app - Breakfast, lunch, dinner and drinks. This he equips with the corresponding impressions or recordings. 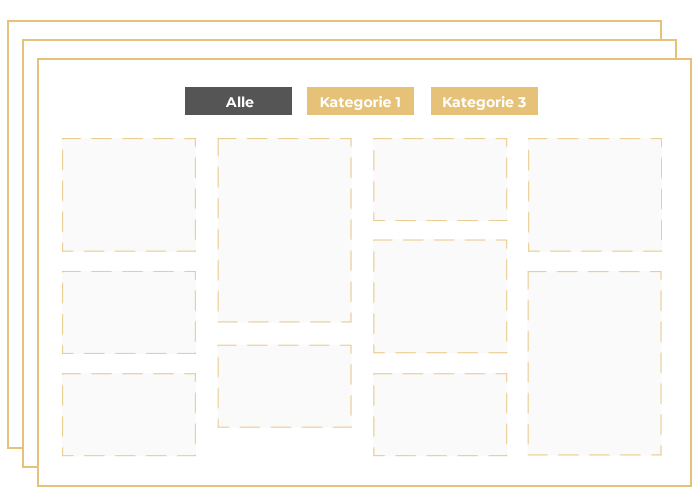 On the start page Figo simply shows his visitors all categories, which he implements thanks to the "Filter" function. 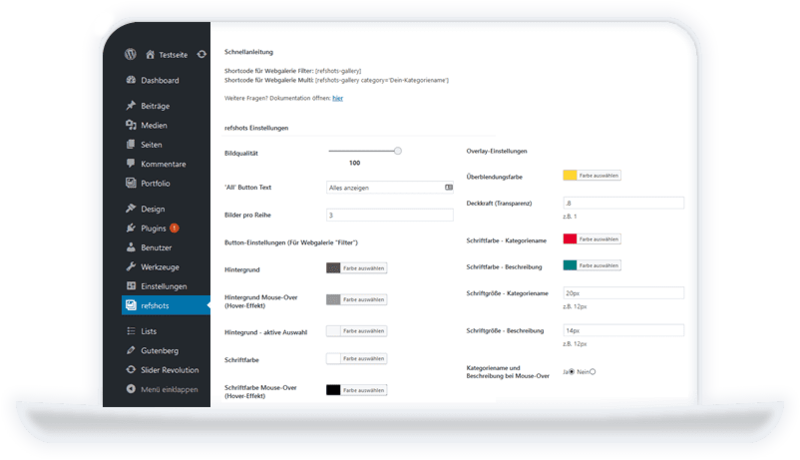 On the subpages Figo wants but hide the non-matching categories, he uses the shortcode with the function "Mix". For the underside "Breakfast" he shows somti only the category "Breakfast" and "Drinks" and decides whether a filter function at this point makes sense or not. The same process he performs for the other subpages and thus can control all his galleries on the website through his app. Thanks to our WordPress plugin, both the installation of your refshots® web gallery and its integration into your existing design are easier than ever. You don't need any programming skills to use the different configuration options. Set and test them directly in the WordPress admin area via the plugin settings. Decide yourself in what quality and file size you want to display the pictures in your web gallery. By default, three images per row are shown on your website. Choose yourself whether you want to keep the custom setting or change it. Adjust the colours of the buttons in your web gallery "Filter". Choose background, font colour, etc. Decide what happens in which design when a visitor moves the mouse over your images. Decide yourself whether the category names and image descriptions shall be shown when the mouse moves over the pictures. In addition to further colour settings, you can also set and adjust borders, shadows, and text positions.